This article deals with the ways to Reduce Stretch Marks after weight loss. You’ve ordered salads when you wanted a burger. You drank water when you wanted soda. You’ve said no when you really wanted to say yes. You worked hard; you’ve sweat, pushed through when it hurt, and have finally started to see results. Your clothes fit better, you feel better, and people are starting to notice. But one thing you can’t help but notice is the stretch marks. Your body has changed, and although you love most of the new results, you could do without the stretch marks. 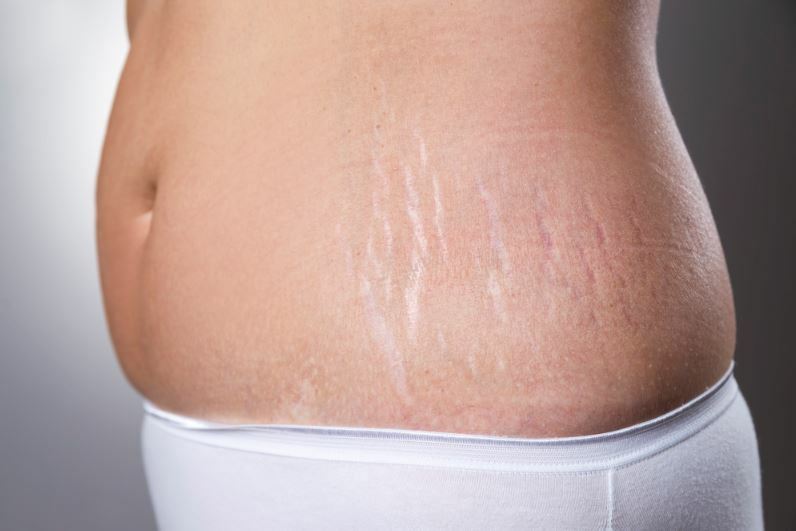 Never fear, there are some proven tricks you can use to not only reduce the visibility of stretch marks but prevent them from happening in the first place. Stretch marks appear may on your tummy, thighs, lower back and sides after you lose weight. When you were bigger, your skin was required to stretch to cover the fat storage underneath. Now that that fat is gone, the skin is left with a red, pink or brown scar from where it was rapidly stretched. How to reduce stretch marks? The key to reducing the visibility of stretch marks is timing. Attending to them as soon as you notice them will keep them lightly colored and less visible. Left untreated, your stretch marks could get darker, more noticeable, and harder to treat. Staying hydrated is an overall good idea when trying to maintain a healthy lifestyle. Water helps the skin stay hydrated, which will minimize the visibility of the discoloration of your skin. Aim for 8-10 glasses of water a day (which you’ve probably been doing anyway to aid in weight loss, right?!) to keep your skin glowing and healthy, and to detoxify your body. Lemon juice and potato juice are popular, natural remedies for reducing stretch marks. Lemon juice works like bleach, lighting the color of dark stretch marks. Simply apply lemon juice to your stretch marks and rub in a circular motion. Let stand for 10 minutes and rinse. Potato juice works to restore damaged skin cells because it is full of vitamins and minerals. Like the lemon, just slice the potato and rub in on the stretch marks in a circular motion. Most people who are struggling with unsightly stretch marks run to their nearest pharmacy and pick up an assortment of oils, butters and creams to apply to their skin. Natural oils like lavender and rose oils have been shown to reduce the sight of stretch marks after weight loss. Cocoa butter and Shea butter are moisturizers and can help fade your stretch marks as well. Some cosmetic creams are made to expand the elasticity of your skin, which is vital in preventing the scarring left behind from stretched out skin. Lotions created with Retin-A are best for addressing new stretch marks, but may not be as effective with older ones. If you’ve tried everything and those stubborn stretch marks still have you covering up your new and improved body, there is always the option of laser treatments. This can be time consuming and expensive but has shown to be the most effective. The best way to prevent stretch marks is to limit the amount your skin has to stretch by maintaining an ideal weight. Your skin goes through many phases throughout your life, just like your weight, so there is no 100% guarantee that your skin won’t stretch and discolor slightly over the course of your life. However, the key to preventing stretch marks or keeping them at a minimum is skin elasticity. Water plays a huge role in this. When your skin is healthy and hydrated, it maximizes its ability to stretch without scarring. Foods rich in Vitamin E, C, zinc and silica help form collagen, which keeps the skin taut and strong. Vitamin C is especially helpful in repairing damaged skin cells and tissue. Exercising regularly has a lot of benefits, but reducing the visibility of stretch marks is one of them. Exercise improves blood circulation, which keeps the skin elastic and makes it easy for skin to stretch (over your new muscles!) without discoloration. Bio-Oil applied to the skin each day is another great way to maintain your skin’s elasticity and prevent stretch marks from happening. Stretch marks are common during pregnancy, as there is no doubt the skin will be stretching to accommodate the growing baby bump. It is important to consult your doctor about stretch mark treatments if your weight loss is due to growing another person inside of you. Weight loss is a huge accomplishment, and you should be proud of yourself. Don’t let a few stretch marks prevent you from showing off your new body! Prevention and treatment of stretch marks really boils down to keeping yourself healthy and hydrated. By taking care of your skin, you can reduce the visibility of stretch marks and feel confident in the new you.